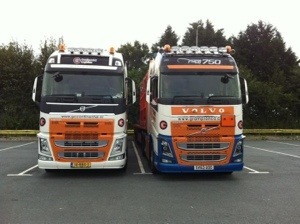 New Volvo – Left or Right?? So we are all divided by the look of the new Volvos front grill. Grampian Continental have both the original and also one with a slightly modified front end to make it look how Volvos have always looked. Thanks to Mark Farrow for the photo. The simple question is; which do you prefer, left or right?? Leave your answers below. It all happened so quickly I climbed up the 4 steps to heaven and it was all over in a flash……….the test drive that is! All I can say about the whole couple of hours is; Very Very Impressed….Amazing….Car Class Comfort….actually I would bet if you blind fold some one they wouldn’t be able to tell the car from the truck, the comfort was very lounge like. 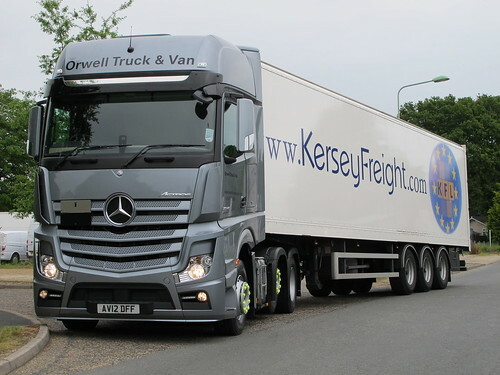 For those who don’t believe, I drove a well know Dutch truck to Orwell Trucks and it was all to easy to note the new bigger seats on the New Actros and with the 2 large padded arm rests, I was about ready for a doze never mind a test drive! On arrival when you first see the New Actros you really are greeted by that huge grill, which actually gets more attractive when you see it in the flesh. I think it’s fair to say it’s not as huge as you think it is looking at it in the magazines. Open the door and there are 4 steps up into the cab, which for some is bizarrely a bit of a problem, but until you try it, you don’t realize how little a problem it is. If your planning of spending all day getting in and out the cab then you will probably build your leg muscles fairly rapidly, but it really isn’t an issue. 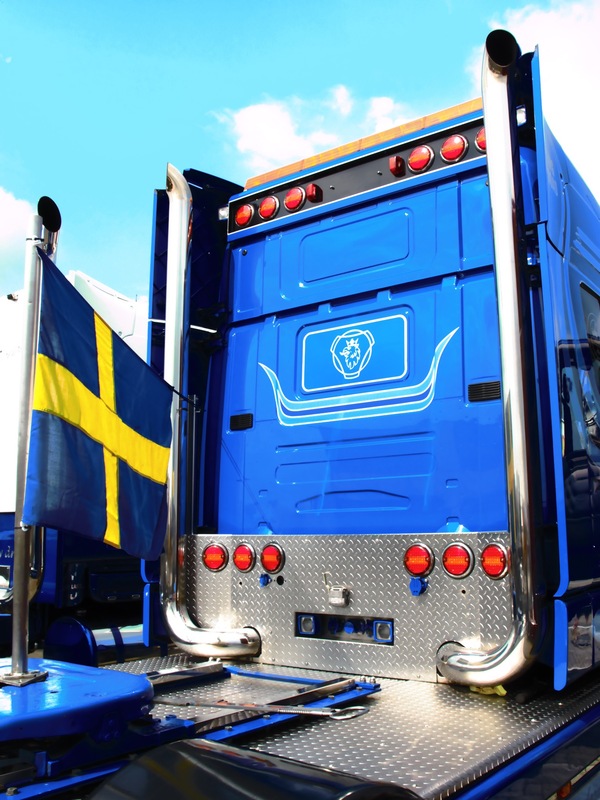 Into the cab, close the door and you hear a solid car like / Swedish truck like clunk. 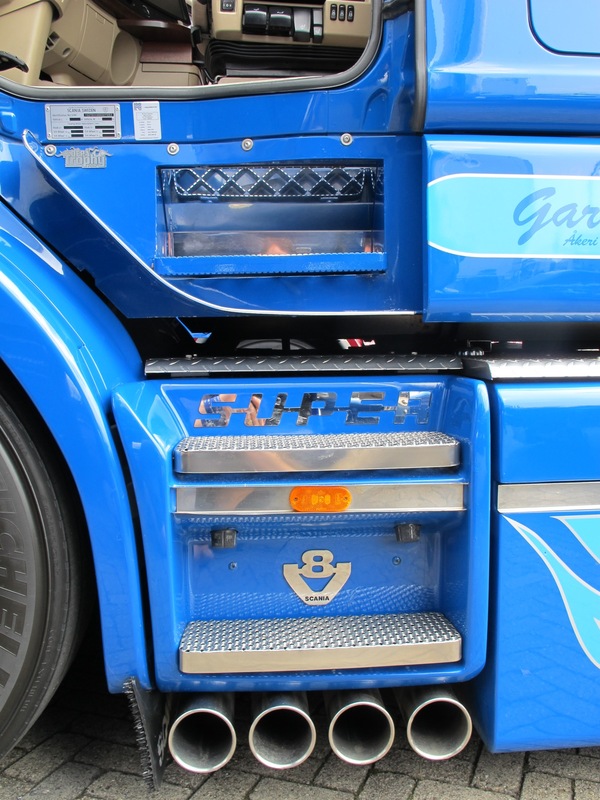 This cab is the biggest of all 7 available, the Gigaspace. 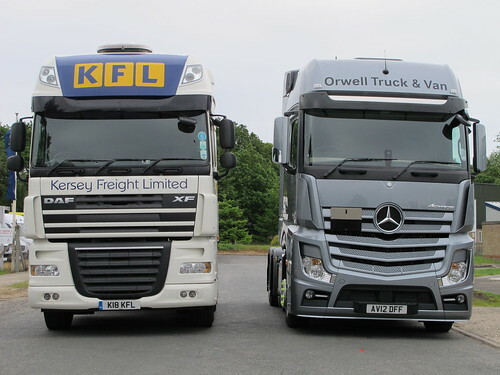 This cab is far bigger than the old Megaspace Actros, in fact the next one down the list, the BigSpace is also bigger inside than the old Megaspace. For stat lovers the actual interior height from floor to ceiling in the Gigaspace is an incredible 213cm / 2.13m / 6ft 11inches & 7/8th’s!! 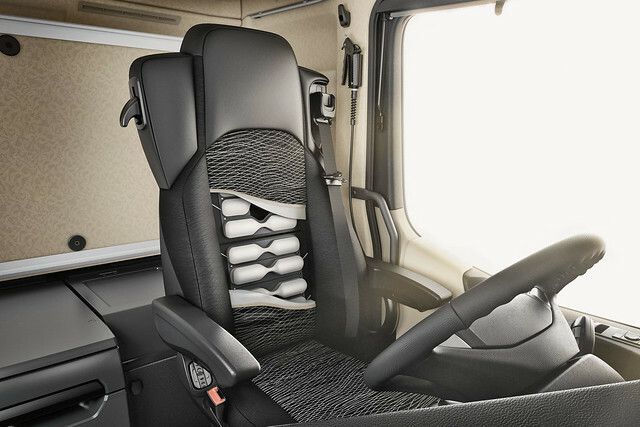 If you can’t stand up comfortably in that space in the morning and put your trousers on, you really shouldn’t be driving a truck for a living. There have been plenty of rumours and comments that the truck range will now use the same interior kit as the car range. This to an extent is true. It has been set up to make the interior of all Mercedes vehicles use the same components and unify the whole lot. The dashboard is very easy to use, as you’d expect everything is easily within reach no matter how you have your big seat set. You now have 2 full size bunks in the Actros, as opposed to the old cab which had the big top bunk and the smaller lower bunk with the bulge in the rear of the cab. 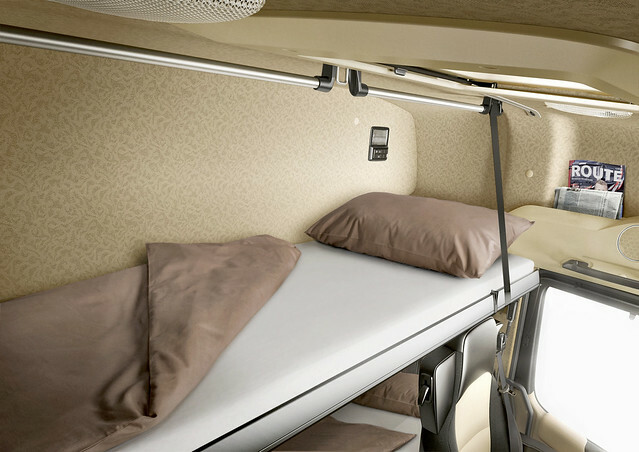 Actually you can spec the lower bunk with a fold up end section so you can sit up in bed. Along with the usual big pull out draws under the bunk, 3 big lockers and 3 cubby wholes above the windscreen, under-bunk fridge options, bunk options, etc etc you can spec so much stuff it’s pretty endless and makes for one of, if not the comfiest cab on the market.There is also a single occupancy cab, which you’ll have to ask your dealer about, as I forgot to ask mine! Actually just to finish on another brochure fact, the Gigapsace has got an amazing 920 litres more space than the old Megaspace. Big. I would love to do an over night test, Mr Dale if your listening! As for the driving of the new big German, it felt so different from my old Megaspace. The chassis is wider which deffinately gives a more stable ride. The gear shift is a fully automatic box which is very smooth but quick, with a manual overide if you feel the need. One of my pet hates with auto boxes on trucks is that you can sometimes feel like the truck doesn’t know what gear it wants to be in and you feel like you have a distinct lack of control. I regularly drive one autobox that will only change itself down to 10th from 12th when you have almost stopped at a junction. To me that’s all wrong you feel the truck is just coming to stop on nothing more than the foot brake, you know what I mean. Naturally I was sceptical of the Merc box in case it was something similar. Why did I worry. Up-shifts are gentle but quick so no momentum is lost. Downshifts are regular and keep the revs high to aid the engine break if required, unlike others I have previously mentioned you feel the engine is slowing down, which restores your confidence and reduces the need for foot braking. After a bit of dual carriage way driving to get used to the Gigaspace, Rob Dale of Orwell Trucks, gently persuaded me to take the truck and trailer back through Ipswich town on a Saturday morning. Surprisingly or not, I was completely comfortable going through the heavy traffic into town, even with Mr Baker undertaking me on the one way system, I didn’t loose him in the big mirrors. I think a few of the shoppers were a little surprised to see me in their way, but luckily for them I wasn’t about to parallel park any where. With the excellent vision you get from the low dash and windscreen I would give it a go, the wife always said I can park an artic anywhere but can’t park her Audi in a field! Driving was a sheer joy and it really does give a similar ride to the big Swede beginning with an S.
All in all, the €10 Billion that Mercedes Benz have spent on this all new truck range, the first in over a decade, may just be worth it. 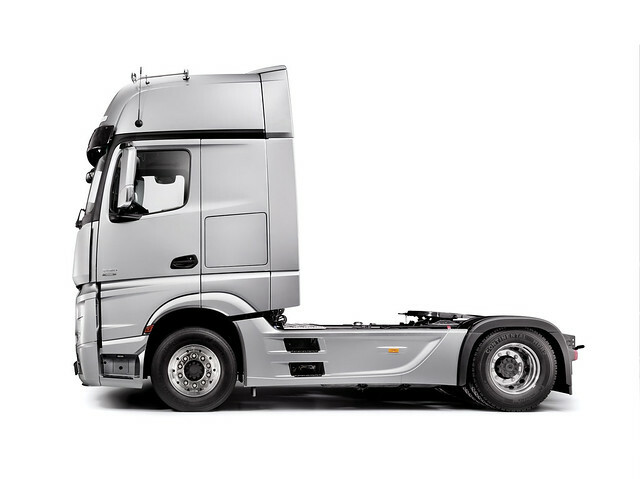 A ride to rival the Swedes, a cab to match/better the Dutch, winner of the International Truck of The Year Award for 2012 and now Truckblog have given it 10/10, what more could the Daimler folk hope for! I know loads of you aren’t fans of the 3 pointed star, but you really can’t knock it until you have tried and tested it. Please take your local dealer up on their offer and get a demo for a week. This particular truck is the mid range 450hp straight six. There is a currently a 420hp, 450hp and a 510hp variant of the Detroit Straight Six in Euro 5, there will also be a 480hp option at Euro 6. Before my jaunt on Saturday morning AV12 DFF had spent the week on containers with DRS Logistics out of Felixstowe. Rob Dale tells me at the beginning of the week the driver wasn’t keen on trying the new Merc as it was like the old one, how wrong could he be! By the end of the week he didn’t want to move out. 100% converted. 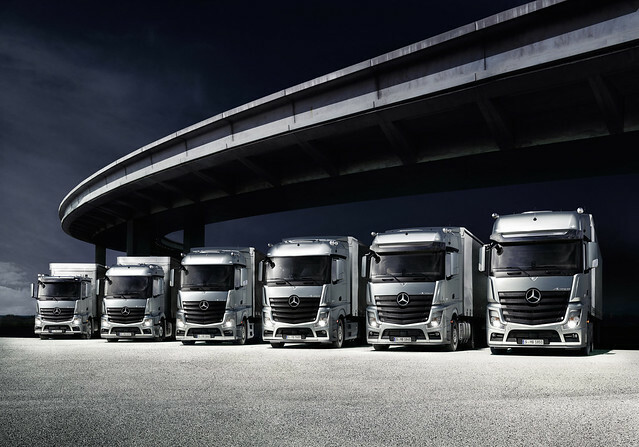 Also with Mercedes Benz Fleetboard system programme it tells how how well the truck is being driven as well as all the fuel figures and the like. During it’s week on containers, it had pulled over 20 tons every day, with and assortment of 20ft and 40ft boxes on a variety of trailers and by the end of the week the truck had returned an average of over 9 MPG, not bad at all as the truck is only a month or so old. There are also bulk tippers that have been returning over 10 to the gallon, so why not give it a try after all Mercedes claim it’s at least 6% better on fuel than it’s predecessor. Ooo I nearly forgot, Rob Dale did want me to note 2 small inconveniences drivers have found. The 2 big external lockers are a bit of a struggle for the shorter driver and it can be possible to catch the heated seat switch with your feet. Thats it. That’s it from me, in short, I was more than impressed. I reckon most of you would be too. Don’t think back to when you last tried a Merc, this is ALL new. So make a date with the new German super model, you might just fall for it. A few weeks back my bossman had to make a unexpected trip out to the continent in his car. Seeing as there was an overnight stay it would have been rude for him not to come back via the Dutch German border at Venlo to see what was lingering at the parking area. Among other things in the early morning light still yet to open it’s curtains was this flexible MAN. Wearing the colours of Gartner KG based in Lambach, Austria, this MAN was loaded with MEN or should that be MAN’s?! I think what caught the boss’s eye was just how adjustable this truck is. Now seeing as I am writing this and we are not actually stood next to the truck, it’s very difficult to show you just how many parts of both the truck and trailer can be moved in order to accommodate what ever vehicles / load is required. 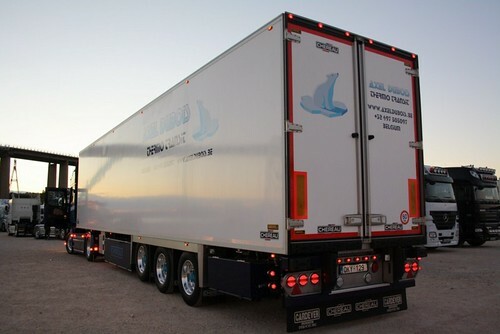 The rear truck’s front axle is on a bed that extends in or out, it retracts back so the rear lights are almost flush with the red side skirt of the trailer, make sense? You can also see that all the wheel wells have small inserts to help raise or lower the vehicle. The rear axle of the front truck on the trailer is on a highly maneuverable ramp as you can see it can raise right up, sort of as it sits now or it will also fold right down and sit flat on the trailer. 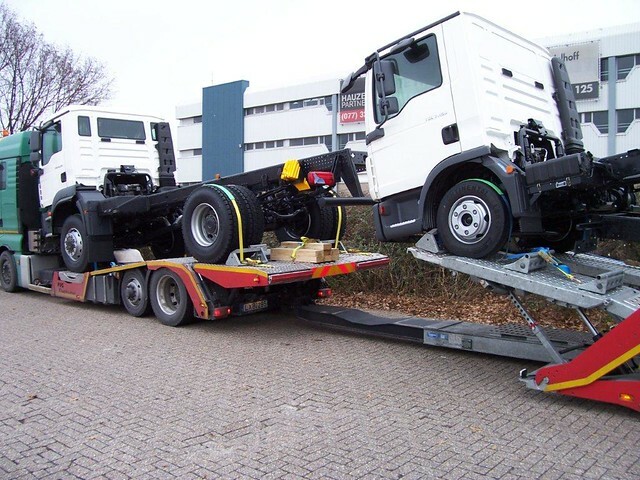 In turn the front axle of the front truck on the trailer is also sat on a hydraulic ramp that can be raised or lowered. Are you getting the all the raising and lowering!? Also not the slight spacing between the first and second axle, also for a wheel well. All in all with all that raising and lowering, I don’t think there will be many vehicles you can’t load. You can see the front ramp on the trailer clearly in the above photo. Also note just for extra flexibility the wheel chocks that are secured into set of holes on the ramps depending on what is required. Now as for the rear of the truck, it looks like the rear section slides up and down to different heights and / or it tilts. There is also has retractable ramps either side of the marker board. 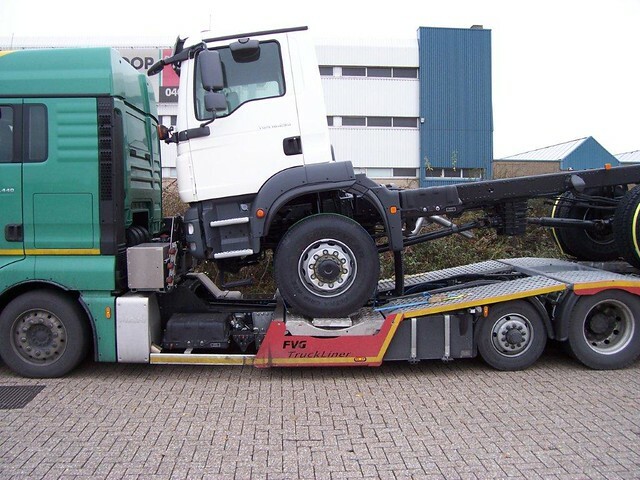 The truck and trailer have been expertly built by German company FVG Fahrzeugbau GmbH and you can actually see one of Gartners trucks in the gallery pages. I think it’s pretty damn clever how they manage to build a truck like this and fit everything in to such tight dimensions in order to maximise the load capability (that’s a bit technical for me – sorry!). The other thing we were trying to work out is where he was taking his load of MEN. It looks like the truck is Polish registered and the trailer has Austria plates on so no real clues there. The trucks could have been made in Munich or Salzgitter in Germany, Krakow, Poland or a good guess would be Steyr in Austria as I think they make small trucks, such as the MAN TGL there, but I could be wrong. 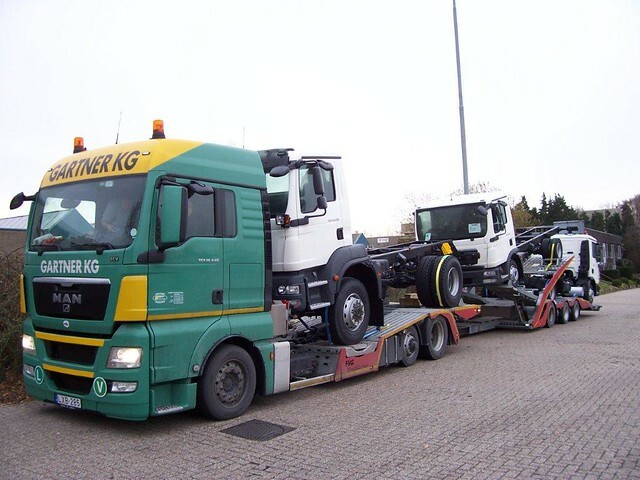 I can only think he would be taking them to a port such as Rotterdam or Zeebrugge to ship them to the UK as all 3 trucks on the load are Right Hand Drive. 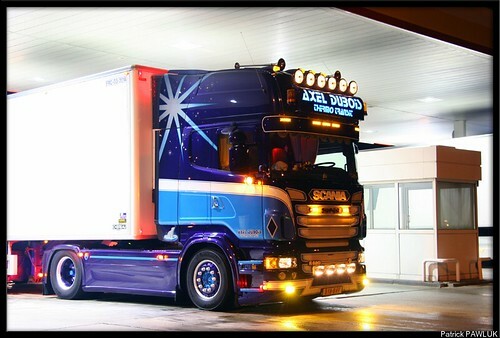 Any way that’s enough from me, smart truck, good photo’s and plenty to chat about amongst you techno-phobes! All that is left to do is apologise on my bosses behalf to the driver for making him jump as he opened his curtains. The boss was busy taking photo’s and having a nose round thinking the driver was fast asleep, so when the driver drew his curtains he obviously thought, “I best be off!” so he hoped in his seat and buggered off down the road……..he must of stopped down the road to do his daily walkround checks! A few weeks back while I was traipsing through the undergrowth of the Internet at endless truck photo’s I came across what I can only describe as an almost perfect truck. you know how in your head you have a picture of what your perfect truck would be, the colours, the truck, the wheels and accessories, if you had your own truck you know how you make it look. Having had my own trucks before, I have a rough idea of what I like. Blues and whites for colours, with a few accessories but nothing over the top. I have owned an airbrushed truck before and in all honesty I don’t think I would do it again. I’d rather have a simple but affective paint job. I also like painted accessories rather than stainless steel ones, things such as light bars and I even tend to favour a painted wheel at the moment over a shiny set of Alcoa’s. Having said all this you will now have a better idea of why this truck seems to be almost my perfect truck. As you can see it has everything I like. 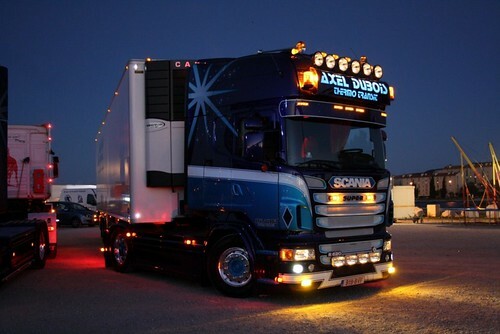 Even better that it’s on a V8 Scania! 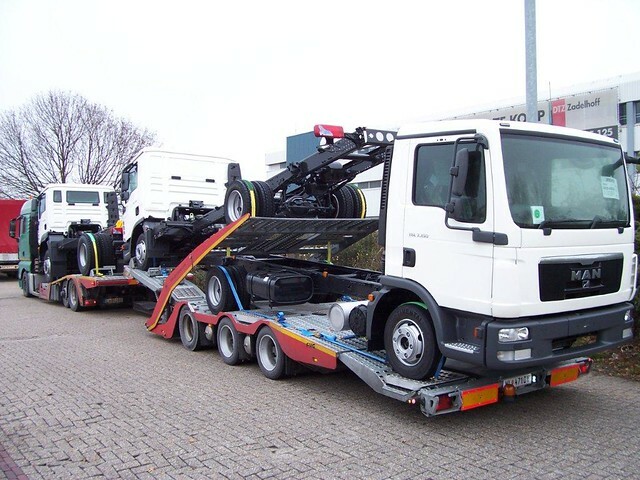 The truck belongs to a small Belgian haulier who goe’s by the name of Axel Dubois Thermo Transit. Where to start??! The simple but stunning paint job, the painted light bars, cab steps, grill and wheels, the few spot lights, grill lights, the light box on the headboard and the aftermarket sun-visor. All in all I don’t think I can say much more other than it is virtually perfect. Even coupled to it’s plain-ish white fridge trailer it still looks good. I guess some of you prefer a painted trailer rather than the white. I can’t say I disagree, but in some case’s such as this I think the plain trailer makes the tractor unit stand out more. On the other hand if you painted the trailer the same scheme as the cab it would look very very impressive, but would it be too much?? They do say you can have too much of a good thing! The truck runs all over Europe pulling it’s fridge trailer mainly, but I have seen photo’s of it pulling a Euro-liner as well. 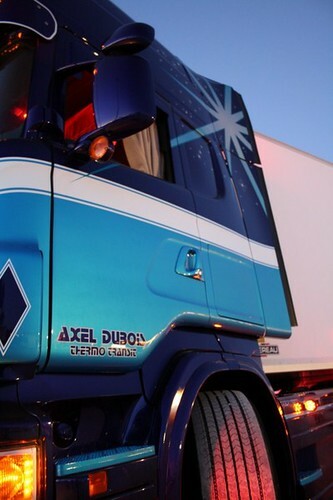 The other thing I really like about the paint job is the big star on the side and the smaller stars dotted about on the midnight blue part of the cab. 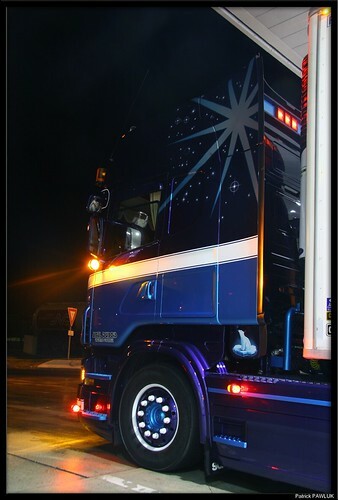 When I had my airbrushed Mercedes Atego I had stars and planets painted in the background and I think it looks good. It breaks up the big expanse of one colour. Also note the little Polar Bear and the painted A-frame holding the air lines. The painted wheels look great, although I do wonder if Mr Dubois had as much trouble making his white nut covers as I did when I was making white ones for my old Scania 141. At this point I would like to thank Patrick Pawluk from www.padborg-express.com for allowing me to use the above 2 photo’s. They are both Patrick’s own. To see more of his handy camera work go to Padborg-express.com when you have finished reading this. I don’t know who’s the next 3 photo’s are, so apologies for not crediting you if they are yours! All in all I think i’d be hard pressed to find a truck better suited to my requirements, unless of course I ever get round to owning my own truck again. I just hope Mr Dubois isn’t one to keep adding little bits to the truck. When you find drivers who keep adding bits to their truck, eventually it becomes to much and it starts to look too busy and over the top. If it stays like it is, then perfect! I best get pally with Axel Dubois so I can copy the paint job!! Would it suit my little 12 ton MAN TGL LX?? I’d be happy to try and find out that’s for sure………..As it goes I have sent Mr Dubois a friend request on Facebook, but had no acceptance yet, then again can you blame him??!! As you know I dont advertise or endorse anything inparticular, what ever takes my fancy really. Due to the beauty of Facebook (not really!) I came across this lot. 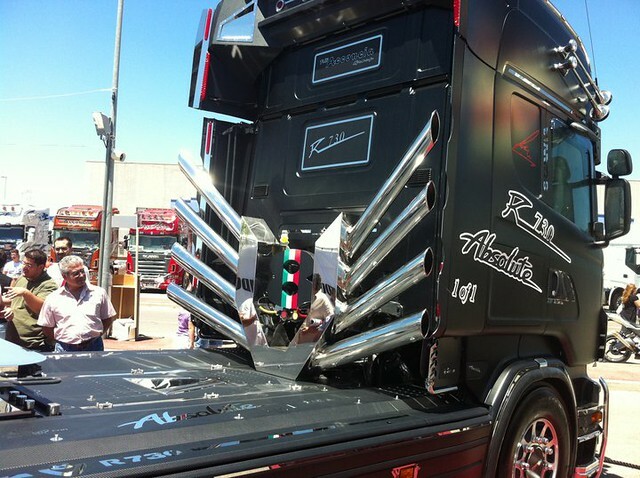 I have no idea how but they appeared on my Facebook, so I had a look through and soon realised they are responsible for a lot of those crazy Italian trucks and their stainless steel accessories. I made friends with them, as you do. This led me to the Acitoinox website and me wasting a good hour or two (much to the wifes horror) looking through the amazing lists of accessories for all the major manufacturers. You can buy a piece of stainless steel for just about every part and position on your truck. Take a look at this R730 V8 Scania, that has clearly been given the Italian treatment, I suppose you could say its had an Italian job (ha ha i made a joke!). 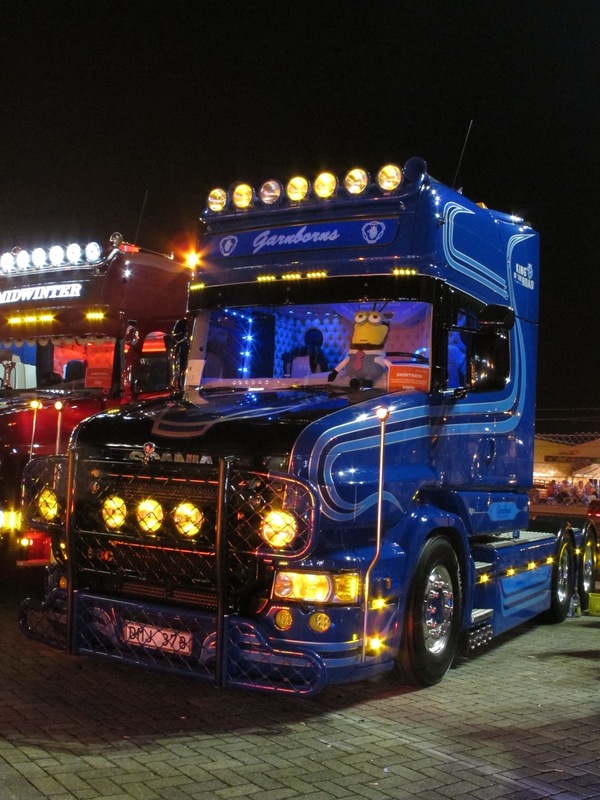 All the accessories on one truck together I have to say is too much for my taste but you have to admit the trucks are just amazing, have a look through the Gallery page. I would be keen on buying a few bits and bobs, but if you feel inclined then go to the Catalogue page, select your truck and get browsing. There are 10 pages of just Scania bits, so you will have your will power put to the limi and your wallet for that matter! ……..yes you are seeing correctly the V8 logo has got pipes coming out of it. Now that is Italian styling and ingenuity at its best!! Not sure how practical it is but thats just me being English! You are also right, the side fairings on the air kit have also been cut out a little to make way for the pipes. I do wonder if all pipes are exhaust or for show, but seeing as it is Italian they must be using all 8 pipes to fire out the V8 tunes, it must sound pretty amazing and loud, especially if your standing on the kerb in the bus queue when it comes burbling past. I think i’ll have to get the bus next time!! As I said i’m not a fan of all the bits on my own truck but you do have to admire the Italian’s, they certainly stand out from the crowd. You always notice an Italian truck on the road. Paint jobs, stainless steel what more can you want?? 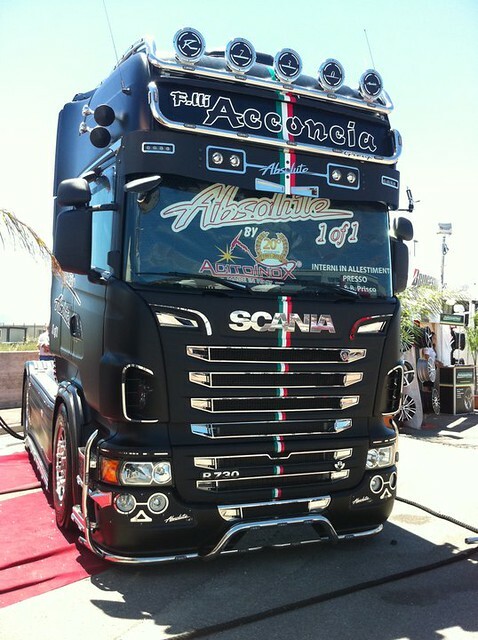 Oh yea a V8 730hp Scania (in Matt Black). 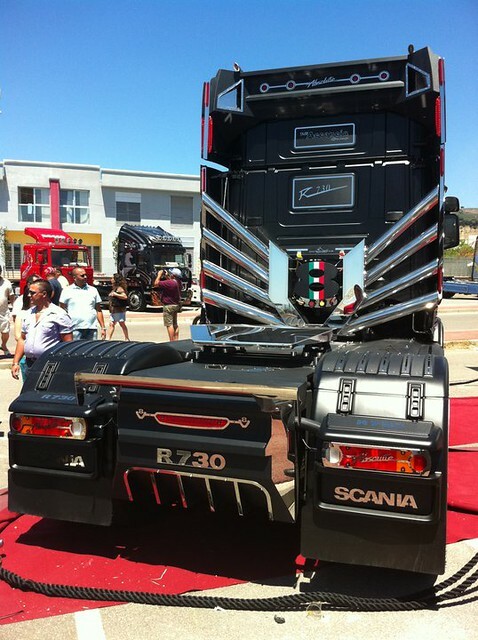 A trip to an Italian truck is in order I think……. Just for info these pictures are all copyright to Acitoinox. 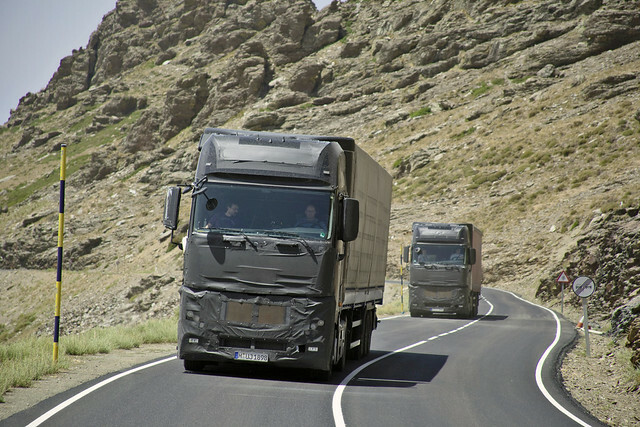 New Mercedes Actros Should be Oscar Nominated! Ged it, ged it??? 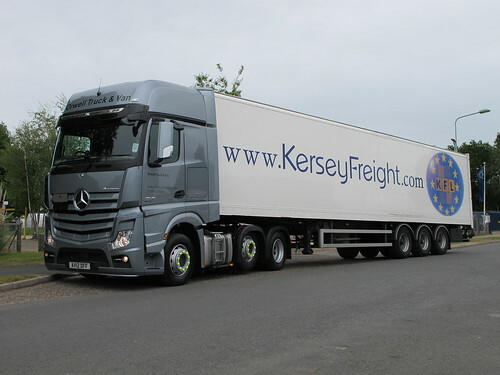 Actros, actress……my comedic talents are wasted on you lot! 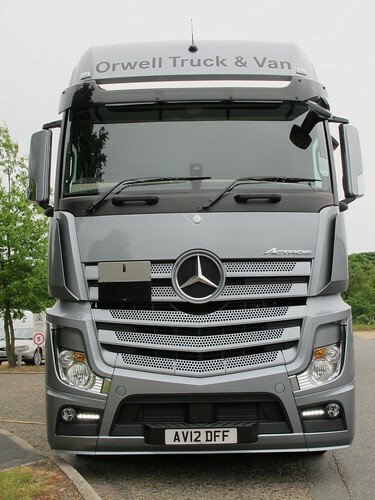 I have been in contact with Mercedes Benz Trucks UK and thought it only fair a do a bit more on this gorgeous new truck. Just look at it………….. that’s all i’ve got to say!! 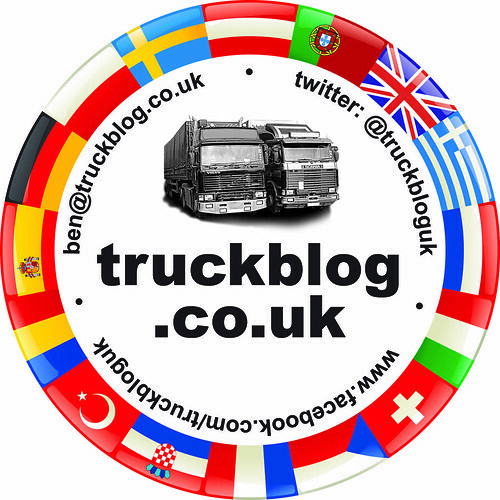 As you have probably already read else where this is a completey new range of trucks. Chassis, driveline, engines and cabs are all new. 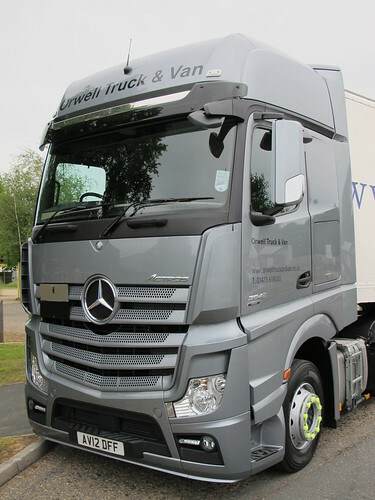 Mercedes are bringing in the new range under the premise “Trucks you can trust”. 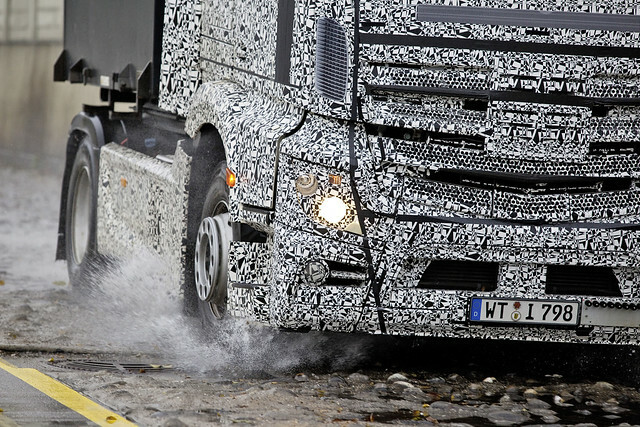 The basis of this is the amount of testing that has been done, supposedly more than any other all new truck. 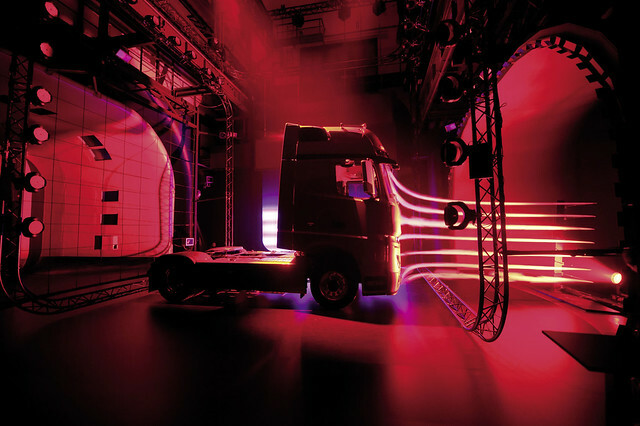 The new Actros has undergone 2600 hours of fine-tuning in the wind tunnel, 50 million kilometres of engine testing on test rigs and in real-life operation, and 20 million kilometres on the road. The foundations for development were laid as far back as ten years ago, and Mercedes-Benz has spent five years testing the components and the complete vehicle. 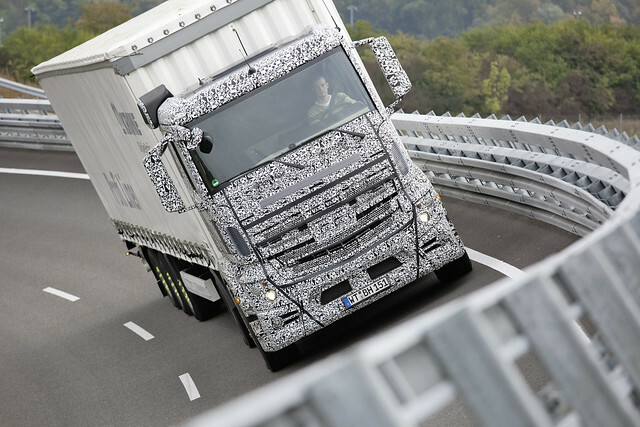 During this time, the new Actros clocked up around 20 million kilometres on the road, including intensive customer driving tests. On top of this, there were extremely rigorous tests on test rigs, torture-track tests and a series of other extreme examinations. 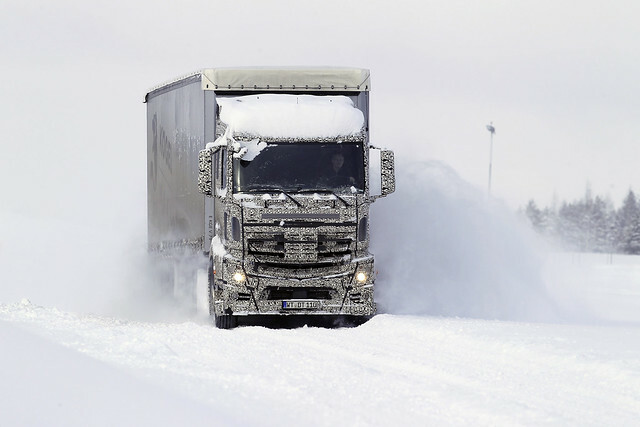 The real-life road tests covered all climatic conditions as well as extreme road conditions and gradients, ranging from an Arctic winter to an extremely hot desert climate. 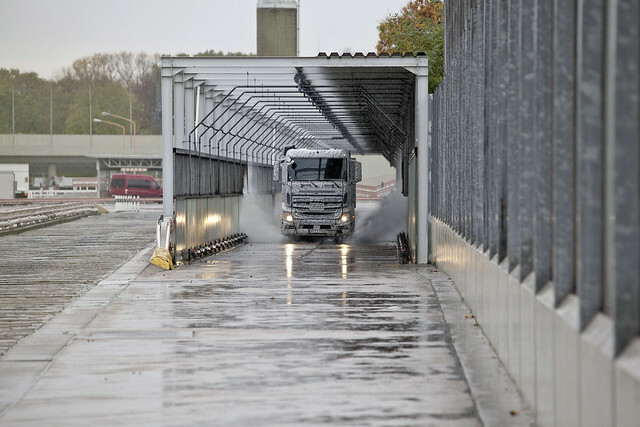 Real-life testing also included customer driving tests in the new Mercedes-Benz Actros. I do love those test trucks. They are like a Hollywood superstar who doesn’t want to be noticed, so they wear a big hat, massive sunglasses and stand out like a sore thumb. 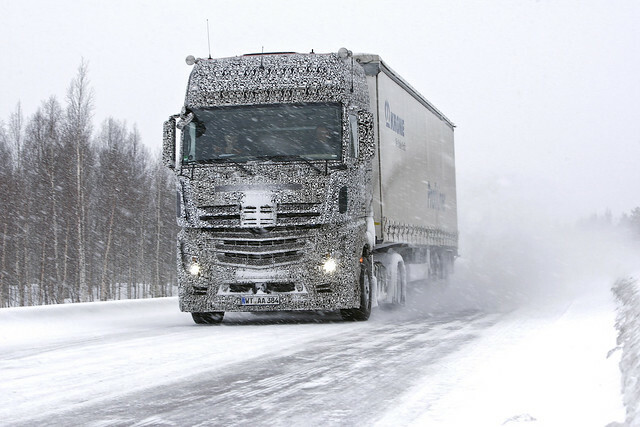 They may as well just sign write the thing with new truck on test, ssssshhhhhhhhhh! Who is going to be the first to have this black and white eye night mare as a company livery?? Brilliant. I sorry to say i’m not going to go into detail on the mechanical stuff, as I have never claimed to be mechanical in any way. Best to ask your friendly salesman as they will talk to you as if they know what they are talking about where as i won’t. So onto the interior. Although you could claim that the interior does resemble the current Actros range, it is all new. I did hear that the trucks are using components and parts from the MB car range. There will be 7 new cabs in the range of which 5, yes 5, will have a completely flat floor, pretty impressive. 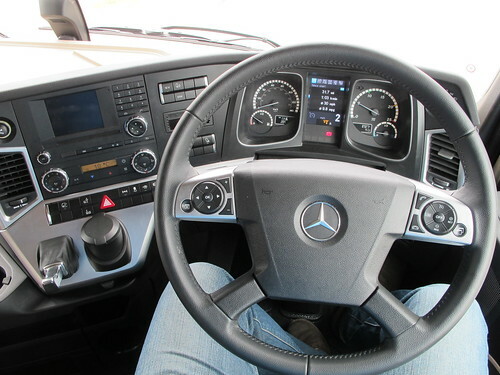 Now as an ex Actros Megaspace owner, I can vouch for the comfort and space in the big cabs. The storage space was never more apparant than when the day came to empty the cab, it took me 2 car loads to clear all my gubbins out. – The long ClassicSpace cab with a standard roof. 2.3 m wide, engine tunnel 170 mm. Headroom on the engine tunnel 1.46 m, in front of the co-driver’s seat 1.59 m.
– The long ClassicSpace cab with a standard roof. 2.3 m wide with a flat floor. Headroom on the engine tunnel 1.64 m.
– The long StreamSpace cab. 2.3 m wide, engine tunnel 170 mm. Headroom on the engine tunnel 1.79 m, in front of the co-driver’s seat 1.84 m.
– The long StreamSpace cab. 2.3 m wide with a flat floor. Headroom 1.97 m.
– The long StreamSpace cab. 2.5 m wide with a flat floor. 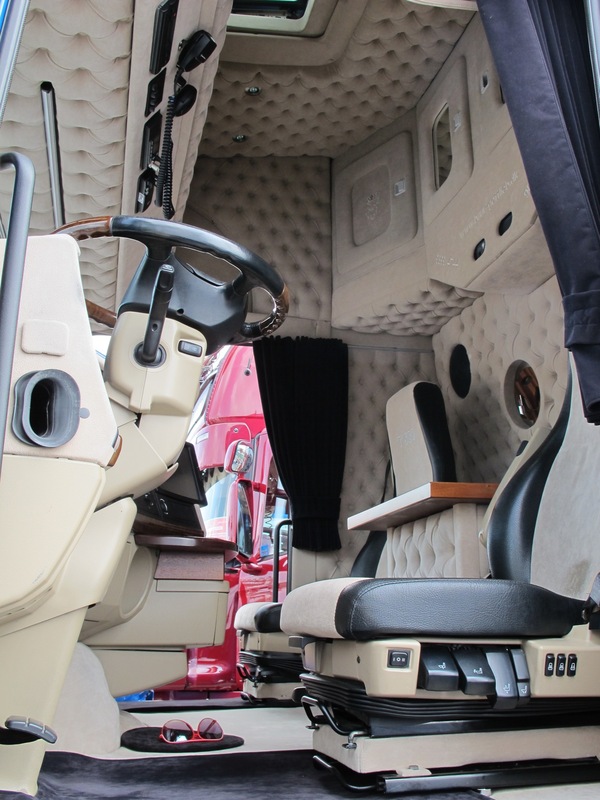 Headroom throughout 1.97 m.
– The long BigSpace cab. 2.5 m wide with a flat floor. Headroom throughout 1.99 m.
– The long GigaSpace cab. 2.5 m wide with a flat floor. 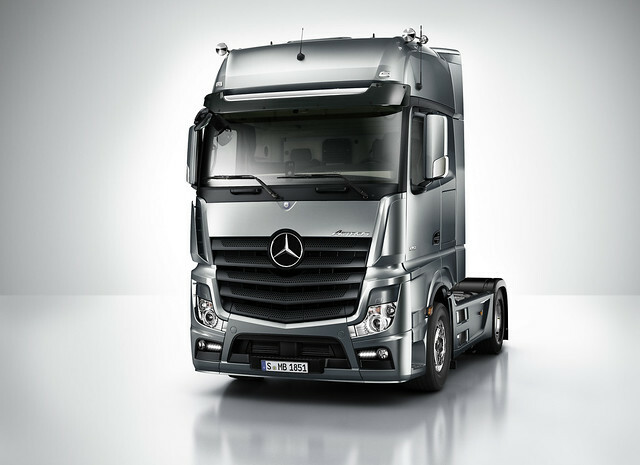 Headroom 2.13 m.
Along with all the other things you would imagine a new truck to have, including a top of the range, Mercedes Benz developed seat that is wider than the standard and incorporates a massage function……ooo-eerr!! 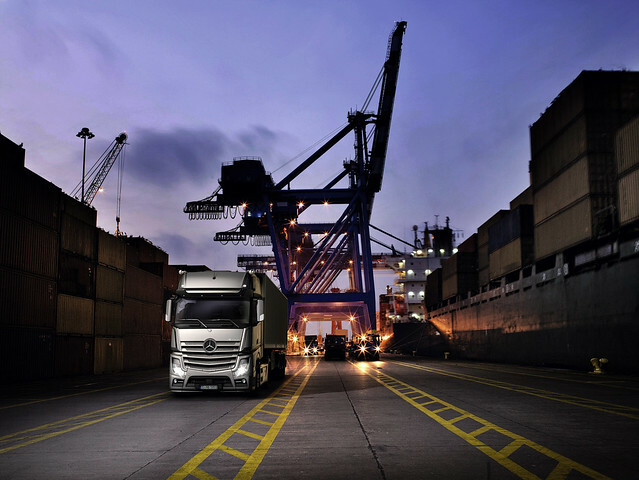 In terms of height, the only thing that limits the new Actros is legislation: the previous MegaSpace cab is replaced by the spectacular GigaSpace cab, which opens up a new dimension in space. It is all but four metres high and, when it comes to spaciousness, trumps its predecessor by some 920 litres – almost a whole cubic metre. This extra space is reflected in a headroom of 2.13 metres throughout and a noticeably larger stowage capacity. 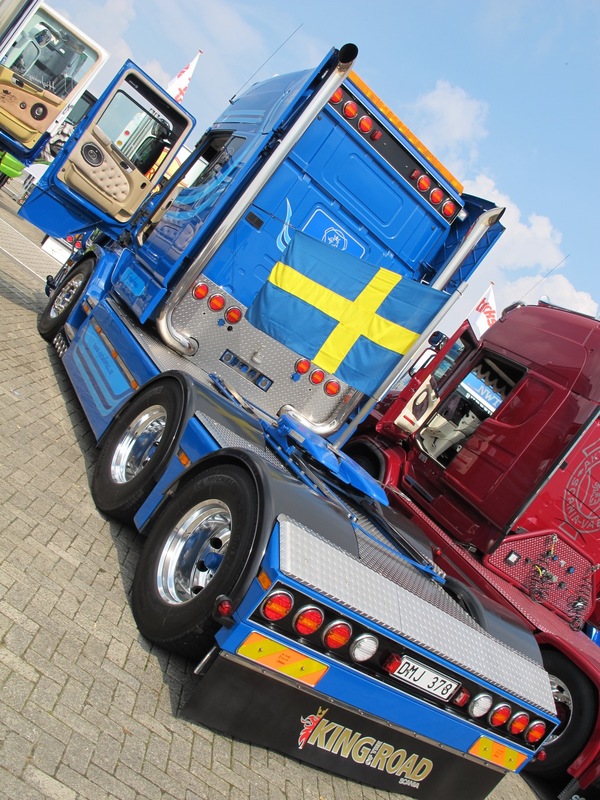 The total volume of 11.6 cubic metres is a record for a European truck cab. Just keep your grubby mits off those beige areas. Lovely as they are, i’m still not convinced they are a good idea in a working truck. 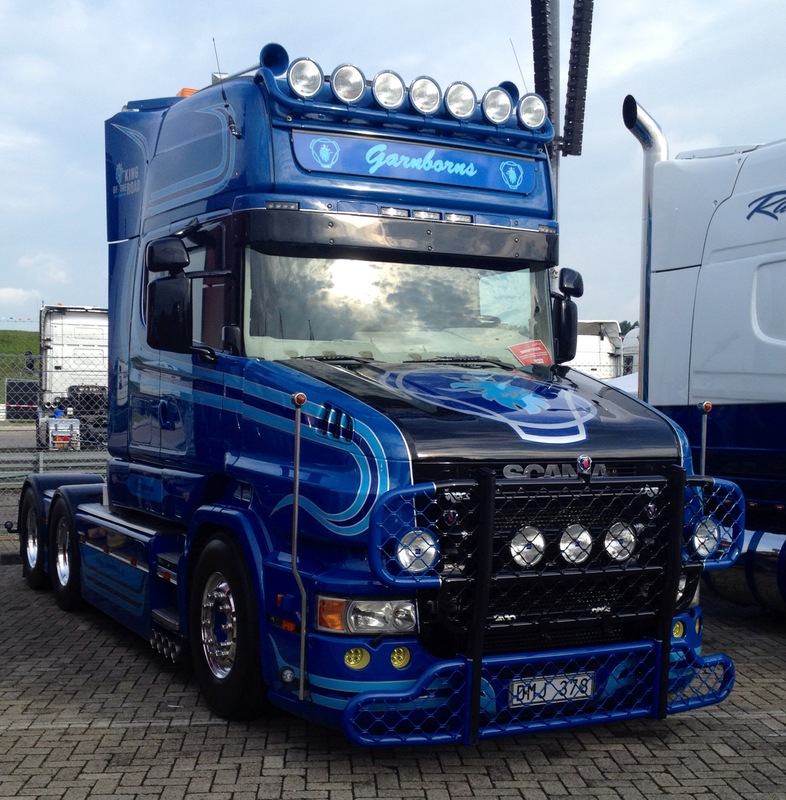 As an owner driver i would and Mrs Truckblog would make sure it was kept clean. Saying that, all the area’s you are likely to be touching and standing in,all look to be black / grey coloured. Just not sure how the fleet trucks will fair after a few years on the road. But i have to say it does make for a lovely living area. You would struggle to haul yourself out of such a cab to go into oour crappy motorway services. Now here’s an idea, perhaps if your lucky enough to get one of these new cabs, you should park up and charge other drivers to come and enjoy your lovely new cab!! or better still perhaps Mercedes should take the new trucks to the plonkers who run our Motorway Services Area’s to show them what our drivers need to relax. One new option you can spec is the “SoloStar Concept”. This gives a sort of corner sofa in the passenger side set back against the rear wall. Also as you can see below, there is what looks like a fold up/out table for you to sit and try to read up on the ever complicating drivers hours rules or some such! Finally i’ll leave you with a cracking photo of this new truck. I hope that this wont be the last you here about it on the blog, as i’m hoping to have some more feedbck from Mercedes Benz them selves and you never know i may even get a test drive, well thats what i hope!! Good truck, sorry GREAT Truck, my predication and a fairly obvious one, this will be a clear winner in the Truck of the Year competition next time around.